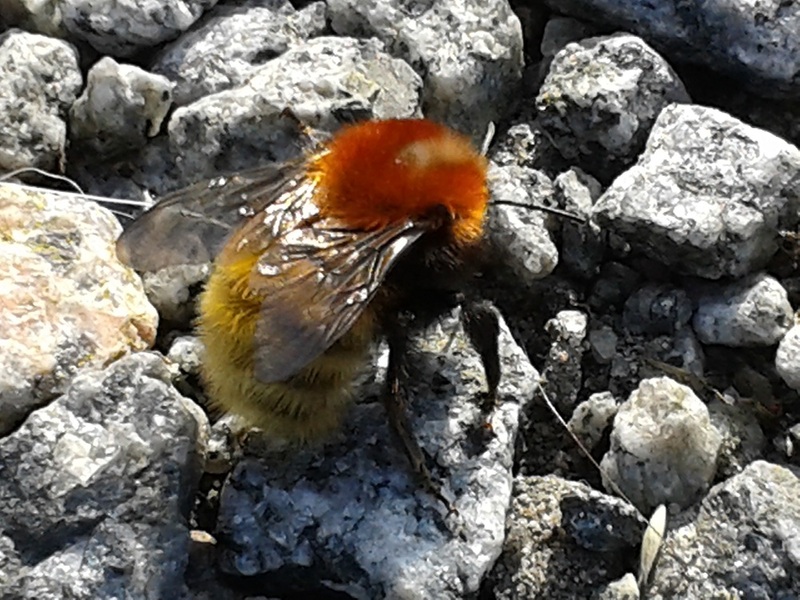 Moss carder bee (Bombus muscorum). Photo credit: Dorothy Breckenridge. A scarce but widespread all-ginger carder bumblebee, found in open flower-rich grasslands where it shows a strong preference for clover, knapweed, red bartsia and similar flower species. The species is more frequent in the north and west, and is largely coastal in the south. Males, workers and queens are similar in appearance, ginger-brown all over with no clearly-delineated tail. The abdomen is usually paler than the thorax, and almost appears blonde in some specimens, often with a more intense colour on the second abdominal segment. Moss carder bees. Photo credits: James Riall (left), Gordon Drummond (right). Separating the three ginger carders can be considerably harder. The Moss carder bee has no black hairs on the abdomen (unlike the Common carder) and also has no black hairs on the thorax (Brown-banded carder bee has a thin scattering of black hairs around and above the wing bases). The presence or absence of a dark abdominal band is not a reliable feature for splitting the species. Males can be separated by their genital capsules.